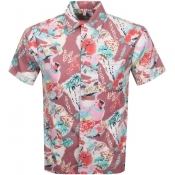 Buy Replay Shirts with Mainline Menswear. Replay has been a top quality Italian designed mens clothing brand since its introduction in 1978 by Claudio Buziol. Only the best quality cotton is used to make the tailoredshirts giving the best fit and feel and a distinct sense of quality from the fantastic Replay shirts.